Apple today announced the iPhone 7 and 7 Plus, which both come without a headphone jack. To make up for the lack of a headphone jack, the iPhones will be shipped with a Lightning to 3.5mm Headphone Jack Adapter and EarPods that feature a Lightning connector. Apple also plans to sell its Lightning to 3.5mm Headphone Jack Adapter and its new Lightning EarPods on a standalone basis for iPhone 7 buyers who want extra accessories. 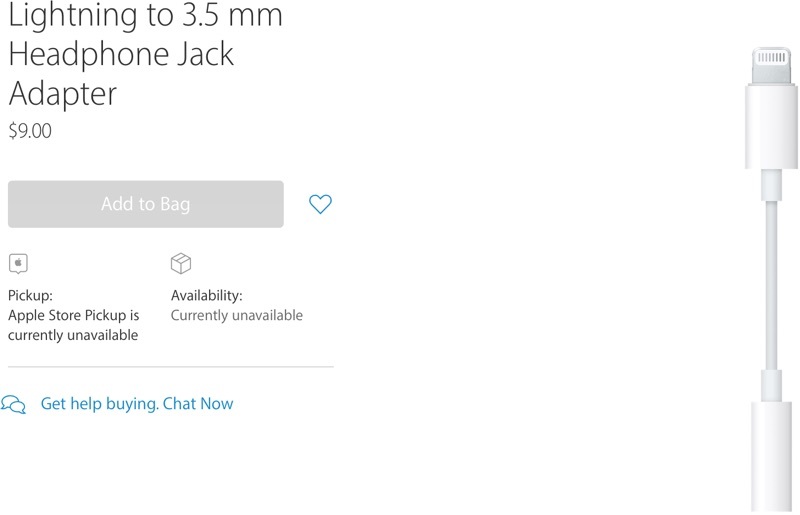 The Lightning to 3.5mm Headphone Jack Adapter is priced at $9 and while it can't be purchased yet, it will presumably go on sale alongside the iPhone 7. The EarPods with Lightning Connector are priced at $29, the same price as the EarPods with a 3.5mm Headphone Plug. 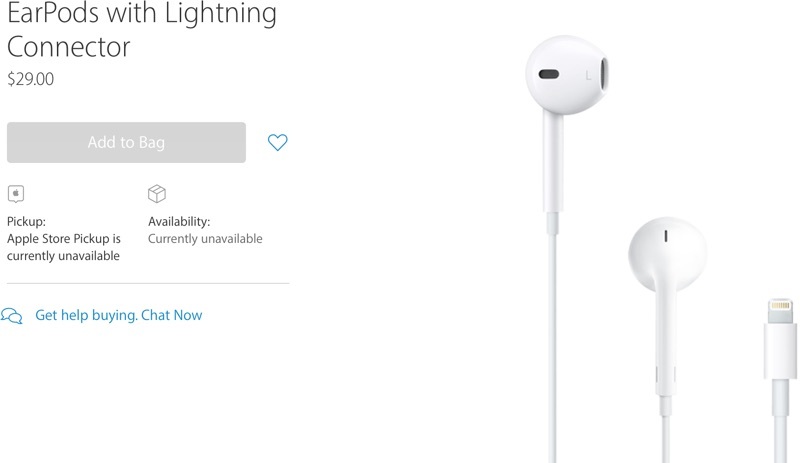 The Lightning EarPods are also unavailable for purchase at the current time, but should be available alongside the iPhone 7. Apple today also announced wireless Bluetooth earbuds called AirPods, which will be sold on a standalone basis starting in October. AirPods will be priced at $159. Apple plans to begin accepting pre-orders for the iPhone 7 and the iPhone 7 Plus on Friday, September 9. The two devices will officially launch a week later, on Friday, September 16. So would we speculate the DAC & AMP in this retail $9 adapter is as good as the one historically in the iPhone? Or the same? Or not as good? Not complaining about $9- just trying to guess whether music converting a few inches from where it used to be converted will sound better, the same or worse than it did when the internal "high quality" DAC & AMP were in charge of converting digital to analog. Argh! No Y-adaptor so I can charge and listen at the same time?!? So on a road trip in the car, without bluetooth, I can listen or charge. Keep in mind the phone is my GPS and also draining power that way too. How about a nice Apple wireless audio to 3.5 adaptor for the car (with microphone)??? So on a road trip in the car, without bluetooth, I can listen or charge. ??? As long as a Y-adapter will be available from a 3rd party, I'll be happy (hopefully by the time the phone ships, or maybe they already exist?). Apple's internal DAC was one of the best if not the best compared to almost any mobile device. So what sort of DAC are we getting with $9? Sounds strange... or can lightning connector also carry analog audio? That would explain the low price of the adapter (no DAC needed then). A dirt cheap adaptor for only $9. Along with including both EarPods and an adaptor when you buy your iPhone 7 it looks like Apple is trying to minimize any problems switching. if i had an iphone 7, i'd rather want the 'reverse' asapter, so i can use the lightning earpods also on my mac. am i insane? that's basically what i connect my earpods to all the time. bigger headphones either go to the home hi-fi or in rare case to the laptop. One simple thing I expect... Being able to charge and listen at the same time... So Apple says "sure, you can dot that. Just buy our new $150 AirPods to free up that single multi-use port that can only have 1 thing plugged in at a time."